so I have to share!! I received an email from someone I had never received an email from before. Though I consider her a friend, I only know her from playing bells in a handbell choir at church a couple times a year. 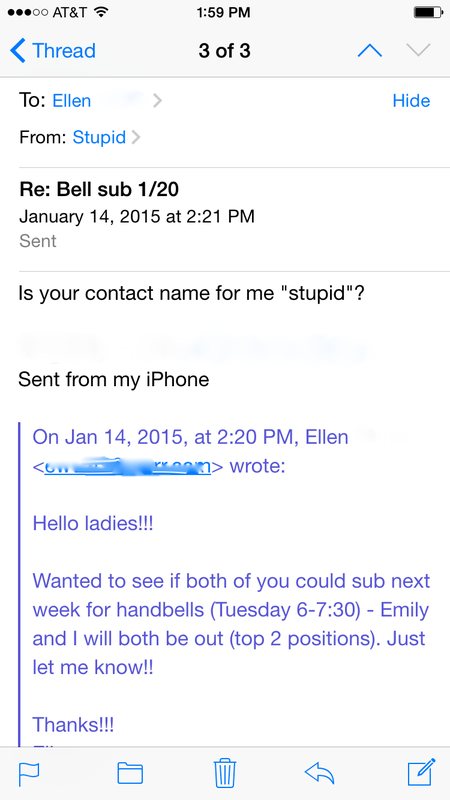 I am not a member of the handbell choir, but I substitute when someone is missing. Wanted to see if both of you could sub next week for handbells (Tuesday 6-7:30) – Emily and I will both be out (top 2 positions). Just let me know!! I am not Sarah Summers. HEY!!!! Why is she calling me STUPID?!!! I tried to give her the benefit of the doubt; surely she’s my friend! She plays in the handbell choir at church; that’s not your typical gathering place of the evil-ladies-calling-people-stupid. There must be a joke I am forgetting…some “Vine” I missed? I remembered she and I have laughed about a lot – I am sure we laughed about ME…it’s easy to do! But stupid? Why am I stupid? But I could tell it was going to eat at me. I had to know. I am not the kind to go talk to someone else and see what they think of her potential rudeness…or pass the email around and get other people to be mad. I decided to confront, seeking first to understand. So I shot an email back to her, asking her if my name was “Stupid” in her contacts. As soon as I sent that email, a flashback of a phone-joke my oldest son did to me popped into my head. He had made shortcut keys for all of the common words I use: “the, an, hi, and, how, you,” etc., so that any time I typed one of those words on my phone, it automatically changed it to say, “blooyah!” I finally had cried “UNCLE!” and made him fix it when I incidentally sent a text to a friend after the loss of a loved one, and my text said, “God bless blooyah.” UGH. 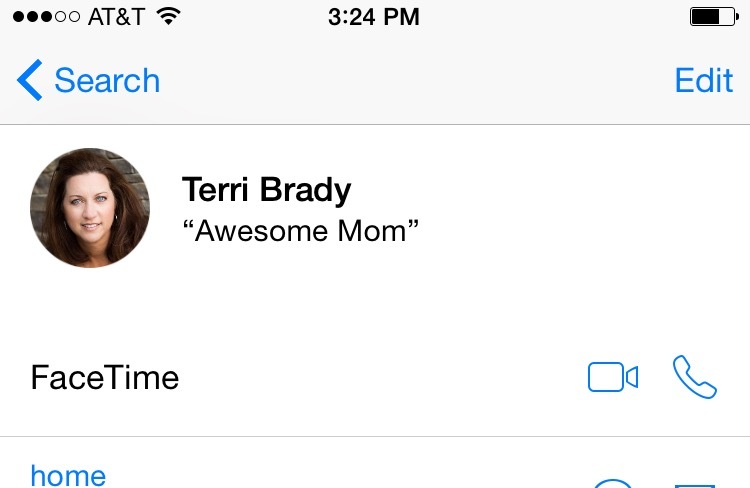 So I wondered if somehow my kids had made “stupid” something on my phone, not her contacts. I searched my phone for the term, “Stupid,” and up popped “Terri Brady”. I looked on my phone for my own name to see how that worked, and clearly one of my kids had picked up my unattended phone and made a change to my contact. Oh boy was Ellen going to be confused when she got that email I had just sent her asking her if my name was “Stupid” in her contacts!!!!! I quickly sent her another email attempting to explain my children’s humor and asking for forgiveness. I let her know that I would be happy to sub for a friend like her! P.S. Looks like my kids changed my contact again. This entry was posted in Uncategorized and tagged Chris Brady, funny, handbells, Humor, iPhone, Orrin Woodward, Siri by Terri. Bookmark the permalink. On my wife’s phone, one of our sons comes up as ‘The son you like the best’. Inventive adult kids (and 4 grandchildren!) are why my iPhone has a lock code on it only my husband and best friend know . . .
Wow! What a story!!! Thanks Terri! This is why we should always have extra grace for people and have the benefit of doubt when crossed. Maybe there is more to the story than what seems obvious. Thank you for the laugh Terri!! This fills up the Fun F. God bless!! Too funny!! I love hearing the stories a out your kids, doesn’t seem like there is a dull moment with them around. Thanks for the great laugh (literally out loud ;-)) this morning, Terri!! You’re the best!! I love your blogs. They brighten my day. That is too funny. I’m sure it wasn’t at the time, but at least your friend doesn’t secretly refer to you as stupid 🙂 Thanks for the dose of humour. I love to hear other moms share their kids “twisted” sense of humor. The way I see it, they know us so well, and love to hear us laugh! Thanks for the reminder to seek understanding first! I’ve realized it’s a trait I HAVE to develop to become a true servant leader. It’s not an easy feat, as a Sanguine, to be patient enough to do that, but, it’s always nice when I know exactly what I should be workino on, within myself, rather than be overwhelmed with deciding which one to do first! Anyway, I thank you for sharing your life with us and can’t wait to add my stories to all the great ones you, and the rest of the Life Coach Ladies, entertain, encourage, and enlighten us with! Have a great day!